Some of the most successful people will tell you that the path to breakout success is to find your unique selling proposition—what makes you or your product or idea stand out from the rest. Companies that embrace what makes them unique are truly some of the most successful, because they’re very clear on what their purpose is. This business philosophy was never more true than for Brown’s – A Short Man’s World in Toronto. 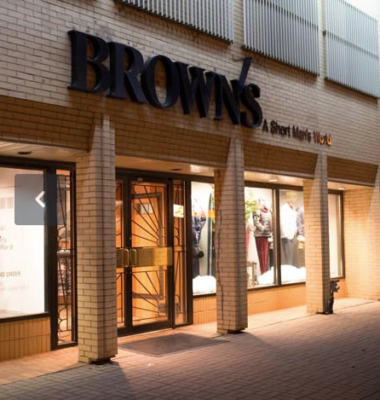 Brown’s (also known as Short Man Brown’s), is a specialty luxury retailer catering to men who are 5’8” or shorter. At Brown’s, everything caters to the stature of the shorter man: the sleeves are shorter, the elbows are in the right place, the pockets are raised, they have shorter socks, the staff is shorter, and as Lou Brown, owner, jokes: “even our prices are shorter!” If you are a man looking for quality clothing and you are 5’8” or less, this is the place for you to shop. Brown’s didn’t start with such clarity of purpose, and wasn’t always geared toward specialty sizes. In fact, when the business began in 1928, they didn’t even sell new clothing. 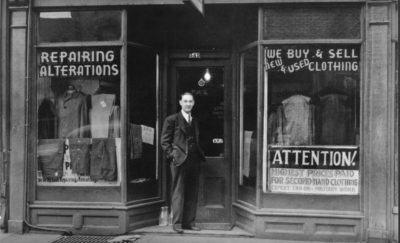 Lou’s father, Willie Brown, was a trained tailor, and opened a modest tailoring shop that also sold second hand clothing. Lou began working with his father when he was just 16 years old. He jokes that the girls he was trying to date weren’t as impressed with the second hand clothing business as he wanted them to be, so he helped push the business toward selling regular new clothing. The business grew for many years. At one point in 1945, they had 4 store locations. With their foundation in tailoring, Brown’s always catered to customizing clothing for shorter men. In 1972 Lou was feeling like he was ready to retire when inspiration struck: he decided to shift the business to specifically serving shorter men. This was a bold marketing strategy—not many people understood niche marketing back in the early 1970’s. Today, nearly 88 years after their humble beginnings, Short Man Brown’s has built a reputation as the preeminent retailer for men of short stature. St. Croix Sale Representative Eddie Gricius is not at all surprised to hear that Brown’s customers respond with gifts. “They found a great niche to serve an entire group of customers that are often overlooked, and in doing so, they’ve created a store that specializes so well. It makes their customer base very loyal—and very fashionable!” said Eddie. And Lou never did retire. He still comes to work every day. He feels it’s now a hobby for him—a good hobby. His son Jeffrey is also in the business, and he’s got a feeling his grandchildren will want to be part of it as well, making this multi-generation family business a regular fixture in Toronto, serving multiple generations of customers. “Our staff is great. The Tailors are great. Our fit is great. We only sell two things: service and quality,” Lou said. Quality in product is something that keeps his customers coming back. One of Lou’s favorite St. Croix items is Golf Knit made by St. Croix with the specialty fit. “If they try it on, they love it and they buy it. If a guy knows quality—they buy that shirt.” Product knowledge is one of the things that has changed the most since the early days of the business. Lou feels that people are more aware and have more knowledge about product than many years ago. And while the internet has certainly changed the landscape of the business, Lou feels that people still want to come into a store. “They want to see the product and feel it,” said Lou.